Photo courtesy of the Jet Propulsion Laboratory / NASA. In this September 1960 photo, Allyn B. 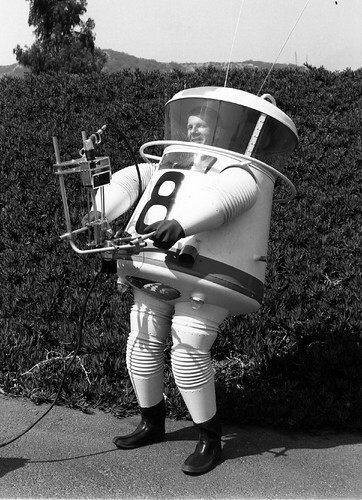 “Hap” Hazard wears a space suit he designed. Hap was a Senior Development Engineer in the Missile Engineering Section of JPL in 1959 when he wrote a plan for manned space exploration. JPL was transitioning from missiles to space exploration, and Hap had a lot of ideas about the subject. In March 1961, Hap left JPL to work at Aerojet, and presumably to work on the suit and his other inventions. In addition to the suit, he designed and built a hydrofoil boat and a snow making machine during his time at JPL. It doesn’t appear that the suit was ever an official JPL project, and very little documentation exists in the JPL Archives except for the photographs and his report, which includes a disclaimer, “The views expressed in this paper are those of the writer ….” The Section 352 online photo album includes a series of photos and drawings of his Lunar Exploration Space Suit Mark 1 and plans for a moonmobile that could be controlled from the dashboard inside the suit. After Hap left JPL, he and the suit appeared or were mentioned in Life magazine, Boys Life, and the Syracuse Post-Standard. An Experimental Engineering class at UCLA studied the suit, and Mattel created an astronaut toy that wore a replica of it. Even today, there are many web sites that include the story of Hap Hazard, his space suit, and Major Matt Mason (the toy). You can click on the image to view a larger version at Flickr.